Shop Handmade UK: Blog Giveways, Discounts & Offers! I'm madly trying to finish many projects as I'm taking a few days break next week. Not going anywhere just having a rest which means I'll actually need to be disciplined and stay out of the studio... We'll see ;). I have a few giveaways, offers and discounts for the weekend. 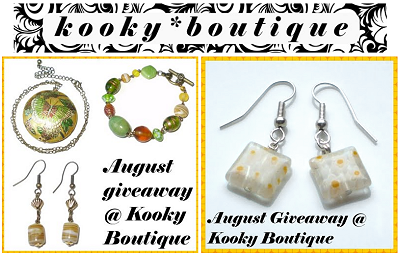 Kooky*Boutique has a double blog giveaway for her gorgeous jewellery to read all the details on how to enter visit her blog. We have 2 Etsyversary deals, the first is from Rachel Lucie Jewellery Designs. To celebrating her 1st Etsyversary she is offering 10% off and FREE Worldwide shipping for the month of September so book mark this now. The 2nd Etsyversary deal is from Mia Belle Jewellery also celebrating 1 year on Etsy with a Buy 1 get 1 Half Price offer. This deal is on now until 4th Sept. Visit her Etsy store for more details. Not to mention there's quite a few deals I previously posted that are still running from Snapdragon Beads, Kalicat Jewellery, CeeGee Jewellery & Pennydog Jewellery. Scroll down to read about these previous deals. Thanks, I did have a nice relaxing time. Glad you've found us and thanks for following. Thanks so much for posting this for me, Belinda. good luck with your sale too!